We are the makers of SolidCore SS, a premium marine plug cable. Our SolidCore SS Premium Marine Ignition Cable is the ultimate in spark plug cable design. Our Patented technology allows us to produce an actual cable made of a durable Stainless Steel core wrapped by silver plated copper and connected by Stainless Steel Snap-Lock end terminals. Zero OHMs resistance relates to unrestricted coil energy delivered to the plug thus greatly improving Combustion Performance. Specifically for use on inboard and sterndrive boats with conventional or distributorless ignition systems. We encourage the use of SolidCore SS on Racing, Commercial, and Law Enforcement vessels! Standard plug wires are power robbing by design. The common plug wire doesn't even contain metal in it's core. Instead they're constructed with a carbon impregnated latex or silicone to reduce the high voltage affects on radios known as "Radio Frequency Interruption" or RFI. This builtin resistance greatly reduces coil energy delivered to the plug. The resistance is relative to length creating an imbalance with conventional systems. Standard ignition wires are also prone to progressive breakdown requiring the need for replacement. Marine engines operate under a constant load and never coast unlike their automotive counterparts. Any improvements in efficiency, power and balance are noticeable. SolidCore SS with Zero Ohm resistance will improve an engine's personality. Metallic core wires have been widely used for centuries in high performance applications where radios and sensitive electronics aren't present. Our Patent SolidCore SS brings the benefits of metallic core to recreation, commercial, and law enforcement vessels. SolidCore SS is guaranteed not to disturb TV's, Radios, Sound Systems, Navigation Electronics, Computers, and Sensors. Increased Horsepower & Torque = Increasing energy to the plug improves combustion performance. A strong and more reliable spark provides a superior burn therefore increasing horsepower and torque. Improved GPH (Gallons Per Hour) = Increasing horsepower and torque while using the same amount of fuel relates to improved GPH. Longer Cruise Range = Reducing GPH increases the range on a tank of fuel. Cleaner Burning = More spark energy provides a cleaner and complete burn that improves environmental impact. Quicker Starts = More spark energy available at startup reduces cranking time and dying. 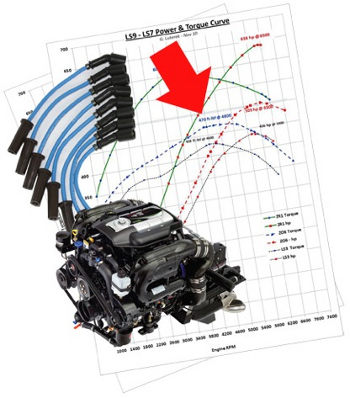 Reduced Load Affects On Speed = Towing and direction changes increases the load applied on and engine. Increasing torque aids in the engine maintaining speed. Improve Hole Shots = More horsepower and torque improves acceleration. Smoother Idling & Operation = Zero OHM's resistance allows all plugs to receive the same current giving the engine better balance thus smoother. Stop Missing = A stronger and more reliable spark energy reduces missing. No Progressive Breakdown = Carbon impregnated cores progressively breakdown due to vibration, heat, and usage. SolidCore SS is 100% Carbon Free and will not experience progressive breakdown.